I am finally starting to see a few leafy green things (look out ramps and asparagus!) at the Greenmarket, but where the heck are the fruity things? Yeah, rhubarb, you may technically be veg, but I’m talking about you. It’s still nothing but the same sad apples I’ve been seeing for the past six months…which of course I bought last week. And because they tasted like apples from six months ago, they sat in the fridge for another week, until a feeling of guilt swept over me and I had to think of ways to use them up. R’s mum gave us a waffle iron for Christmas. A great present (it makes two at a time! ), but I’ve no place to put it in our little kitchen, so it lives in its box in the back of the coat closet. Most of the time it’s out of sight, out of mind, but once in a while I like to pry the iron from its styrofoam protectors and switch-up the pancake routine. Why the heck not make apple waffles? I didn’t have it so together that morning that I was able to make waffles and saute apples to go on top…instead I simply poured a little cider and a little maple syrup into a sauce pan, and let it reduce for a couple of minutes. Voila…cider-maple syrup atop a golden spiced apple waffle. Perfect for spring– hehe. Steph’s note: The recipe halves wonderfully if you don’t need six. You can also individually freeze any extra waffles for later breakfasts. -Preheat waffle iron. If you want to hold the waffles until serving time, preheat your oven to 200°F. -Melt the butter; reserve. In a large bowl, whisk together the flour, baking powder, spices and sugars (make sure the brown sugar is free of lumps). In another bowl, whisk together the milk, eggs and vanilla. Add the liquid ingredients to the dry, whisking until they are just combined. Fold in the grated apple and melted butter. -Lightly butter or spray the grids of your iron, if needed. Brush or spray the grids again only if subsequent waffles stick. -Spoon out ½ cup of batter, (or amount recommended by your waffler’s manufacturer) onto the hot iron. Spread it over the grids with a metal spatula or wooden spoon. Close the lid and bake until browned and crisp. They are soft, so you may have to gently peel them off the iron with a fork and spatula. -Serve immediately with suggested toppings, or keep the finished waffles, in a single layer, on a rack in the preheated oven while you make the rest of the batch. I adore waffles – but I can see how a wafflemaker would take up so much space that it would be relegated to a closet. That’s the way my slowcooker is. These waffles look worth it though! They look sooo freakin good. So cruel to see pictures of waffles at 11pm. I so badly want some. I really need to invest in a waffle maker. dammit. I think if I had to pick between waffles and pancakes, I’m the waffle girl! 🙂 Those checks are perfect for holding exxxtra syrup! Bravo to yet another mouth watering photo! I don’t have a waffle maker, but you sure make me want one! I’ve had them in the past, but never had much luck in making good waffles and it was always hard to clean. The boys just got done requesting waffles for breakfast on Sunday…thinking this is just the recipe! Thanks. Yummy! I was just thinking about waffles this morning and now I see you made some! They sound delicious (though sauteed apples on top would be great, too). So great to be back on A Whisk and A Spoon to view/read about all the mouthwatering treats that come out of your kitchen! (I apologize profusely I haven’t been by in a while… not by choice, I assure you!) As usual, you shared another delicious sounding recipe I simply must try (I just recently acquired one of those heavy duty Waring Pro Belgian Waffle Irons- you know the kind that you rotate and flip over, so you have great timing!) 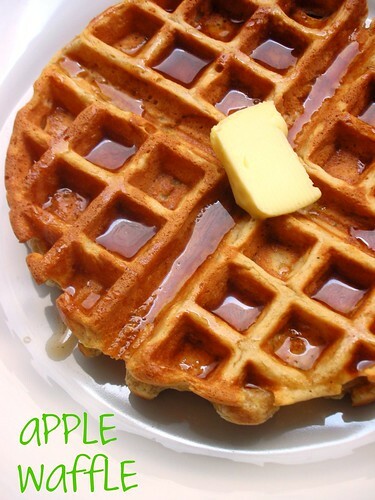 I think it won’t be long before I whip up a batch of your apple waffles for a bit of variation… so far I’ve only made traditional buttermilk, so these sound like a nice change of pace. Do you have an all time favorite waffle recipe you could recommend as well? hi joy! this is only the second waffle recipe i’ve made at home (we made a really great one at a restaurant i used to work for, but the batch yeilds about 40! ), so i’m still finding my way to an all-time favorite. My toddler & I just enjoyed these for breakfast this morning! We have a waffle maker that makes two squares at a time and my little guy ate three of these!! Thanks for a wonderful recipe.